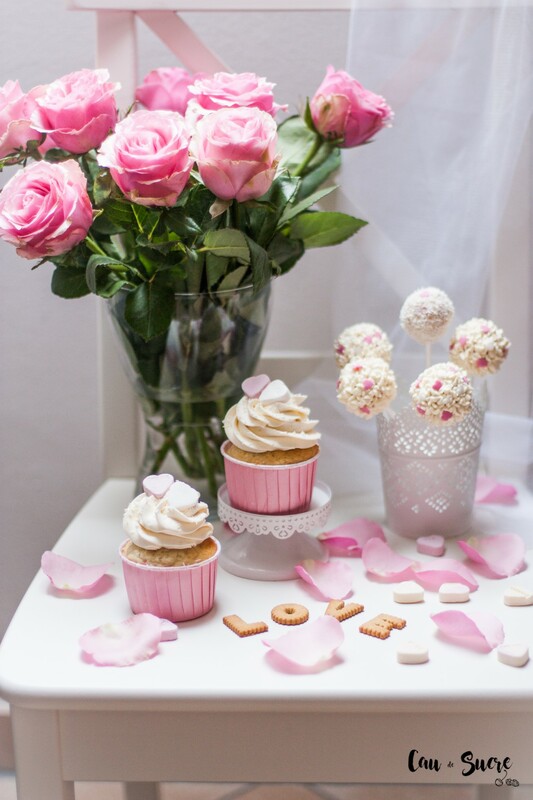 You are going to triumph with these cupcakes and cake pops this Valentine. Do not tell me they’re not cute. If your partner likes coconut, he will love them. And I promise you, that all this can be done with much less effort than it seems. The Italian meringue buttercream with vanilla flavour is so creamy and light, that only with that you are going to win the hearts of your loved ones !! The celebration of Valentine’s day, as I told you last year, is not my cup of tea. I have never celebrated it because I do not think it is good to celebrate the day of love only one day a year, for me the day of love is every day. In addition, it has such a commercial air that it does not invite anything to participate, I am of those who believe that it is an invention of the malls. In any case, I must confess that as far as what is confectionery is concerned, the day invites to make cosy things like these and I cannot resist. And that, as always, I do it for you, since there are many people who do celebrate it and look for recipes. So here I am, to give you ideas every year. 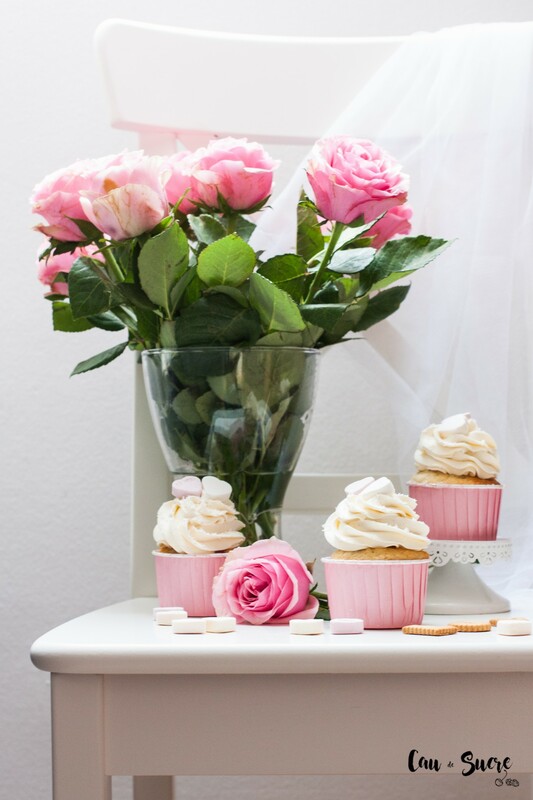 Of course, it is much better to make cupcakes with much love for your partner than buying something in a shop, yes or no? 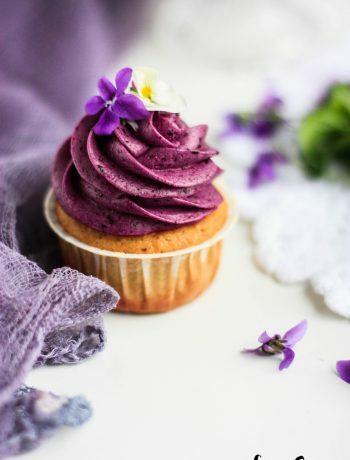 To get an intense coconut flavour in this dough, I modified my vanilla cupcakes recipe by replacing the butter with coconut oil and changing a portion of the flour for grated coconut. And it has been great!!!! 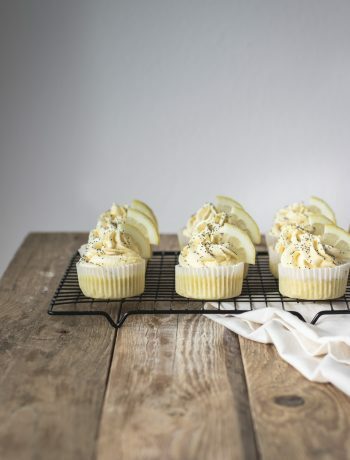 I never tried the Italian meringue buttercream before (the Swiss meringue yes) but the truth is that it seems much simpler this one and the result is practically the same. 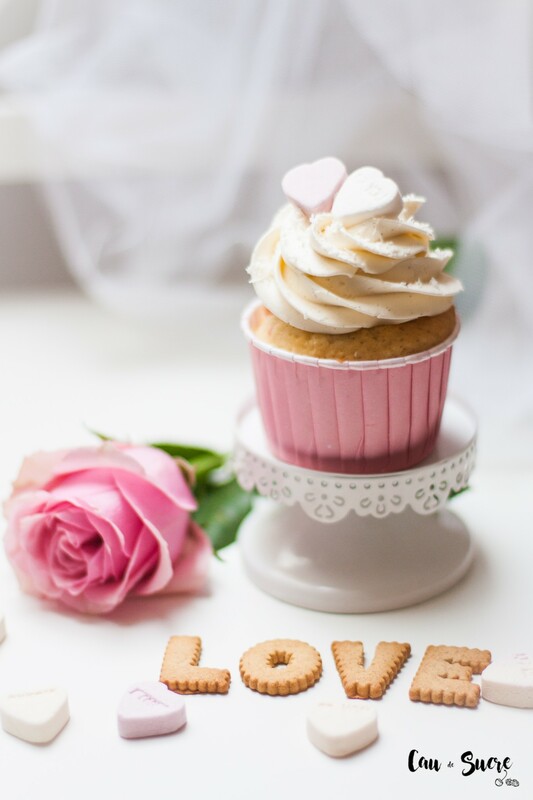 The idea was to make cupcakes with surprise and hide a heart inside so that it was seen when cutting it, is an idea that I saw in the channel of Jemma Cupcakes. But it has been an absolute disasteeeeeeeeeeer !!!! You see in the photos, no heart at all, they moved me when I baked them and when cutting they look like squares or parallelepipeds or I don’t know (Aaaarrrrggghhh). Well, let’s see if you are handier and have better luck, because the idea is very good and it looks very nice. Also, from the part of cake that you must bake in pink to trim the hearts, you will have enough dough to prepare some cute pink cake pops. There is also enough buttercream to decorate all the cupcakes and cake pops. 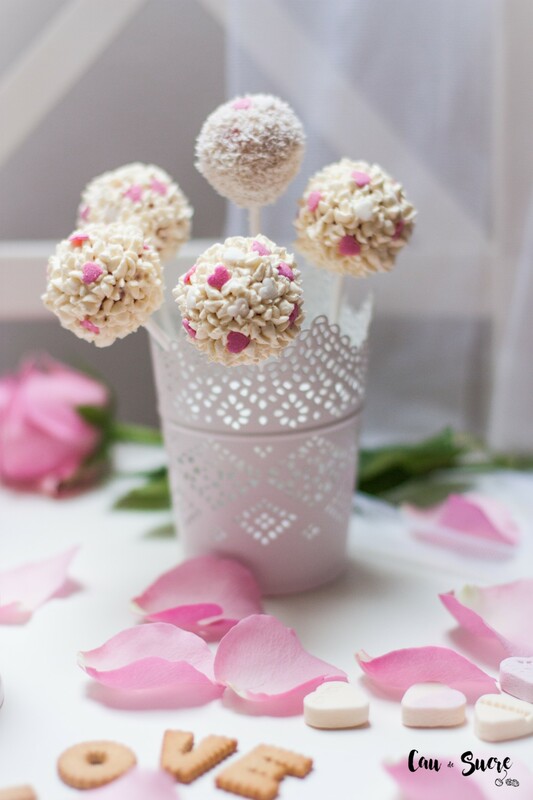 Although, some of the cake pops I have dipped them in white chocolate and they have been very delicious too!! Super long post that I wrote today, well, but it is ok, is not it? Because it is a double recipe and it is also a special Valentine’s recipe. 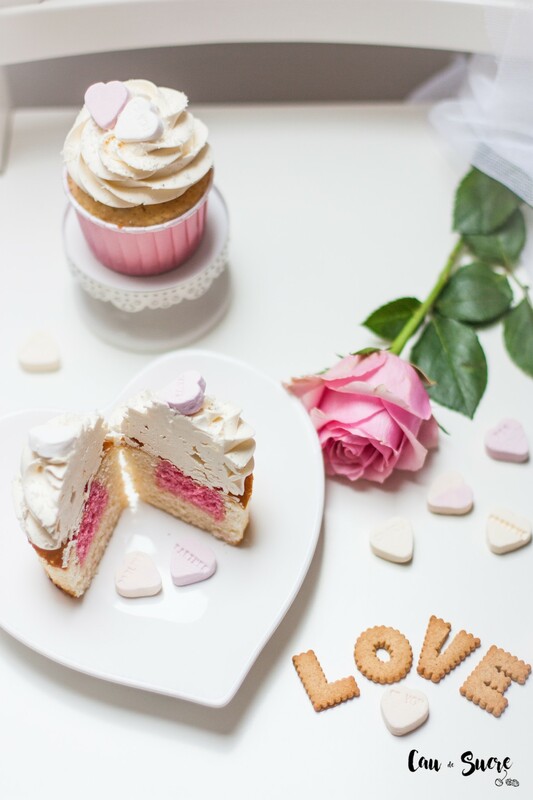 I wish you have a wonderful 14th of February, spread and receive tones of love (but remember that you must do it all year) and enjoy baking those cakes. 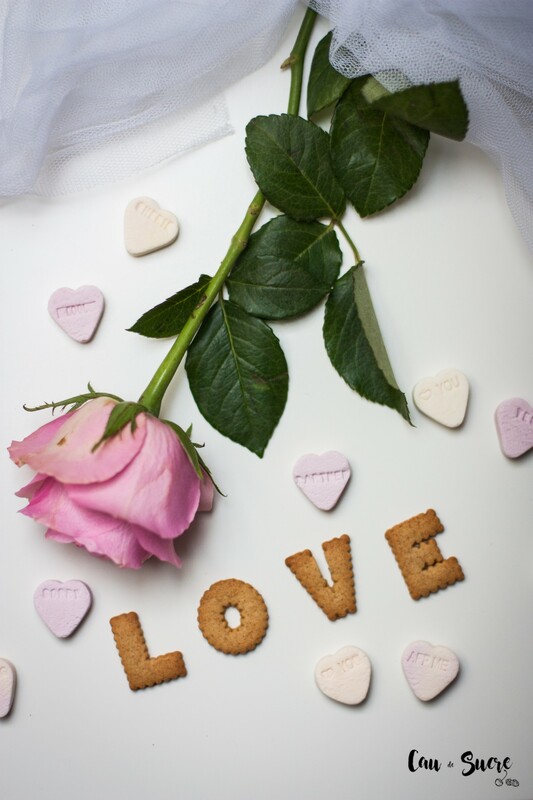 And to those who do not have a partner, just eat them all by yourself and even better! After all, sharing cakes is for losers. Preheat the oven to 180 ° C. Prepare a cupcakes pan with 12 cups (if they are big like mine you will only get 9 or 10). Also grease a round pan about 18 cm in diameter. Beat the coconut oil with the sugar until it is creamy. Add the eggs one by one and beat until they are integrated. In another bowl, sift the flour with the baking powder. Add the flour to the wet ingredients mixture and continue beating just until incorporated. Finally add the milk and the grated coconut and beat until you have a homogeneous dough. Separate 1/4 part of the batter into another smaller bowl. Add to that part the drop of pink coloring. Pour batter (pink) into round pan and bake for about 25 minutes. From here we will get the pink hearts to hide inside the cupcakes. Remove from oven and allow to cool completely. Unmold and level the cake if necessary so that it is completely flat (do not throw anything of the dough that you cut, that's what we will use to make the cake pops !!) Using a small heart-shaped cutter, cut out 12 pink hearts. 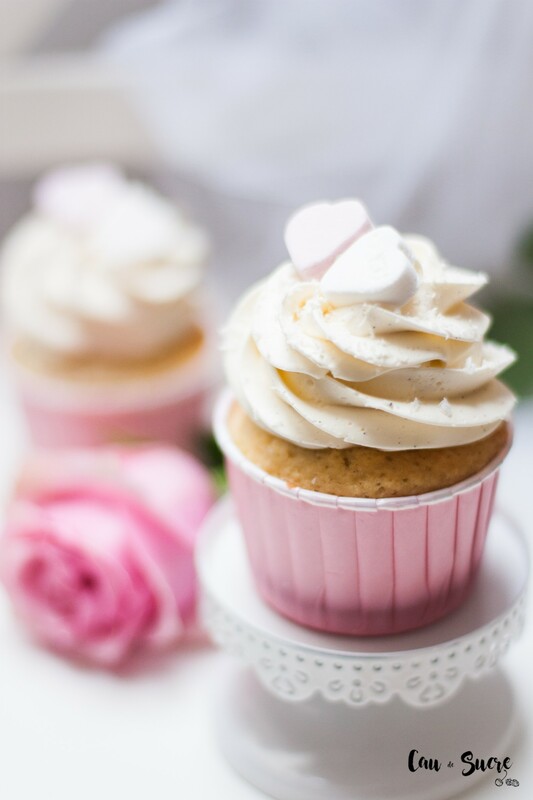 Distribute the rest of the batter (the white) in the cupcakes cups and hide a heart in each of the cupcakes by inserting it vertically into the batter. Put them all in the same direction so that later you know how to cut them. Bake for about 20 minutes, always check with a toothpick that are baked. Remove from oven and allow to cool completely on a rack. To prepare the Italian meringue buttercream, you must first prepare the meringue. To do this, heat the sugar with water in a saucepan. Introduce a kitchen thermometer to control the temperature of the syrup. In the meantime, beat the egg whites at medium speed, so that they become foamy but not to form peaks yet. 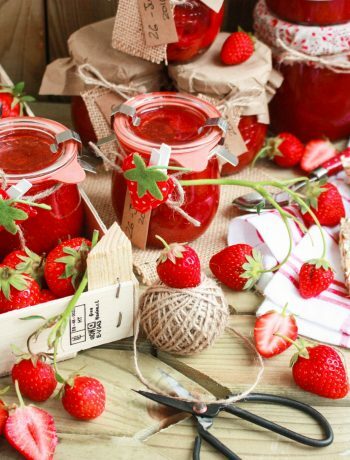 When the temperature of the syrup reaches 118 ° C, remove from the heat and without stopping the mixer, pour into the whites very slowly and in the form of a yarn while still beating the whites at medium-high speed. Be very careful and do not pour the syrup on the moving rods or you can splatter and burn. Continue beating at high speed for about 10 more minutes, until the meringue cools. Before adding the butter make sure the bowl is cold, if necessary wait 5 or 10 minutes more for the meringue to cool. Add the butter in small pieces until the mixture is still medium-speed until all the ingredients have been added, add the vanilla extract and then increase the speed of the mixer and beat for another 5 minutes. There is a moment when it seems to be cut but at the last minute of beating it takes the right consistency, do not freak out. 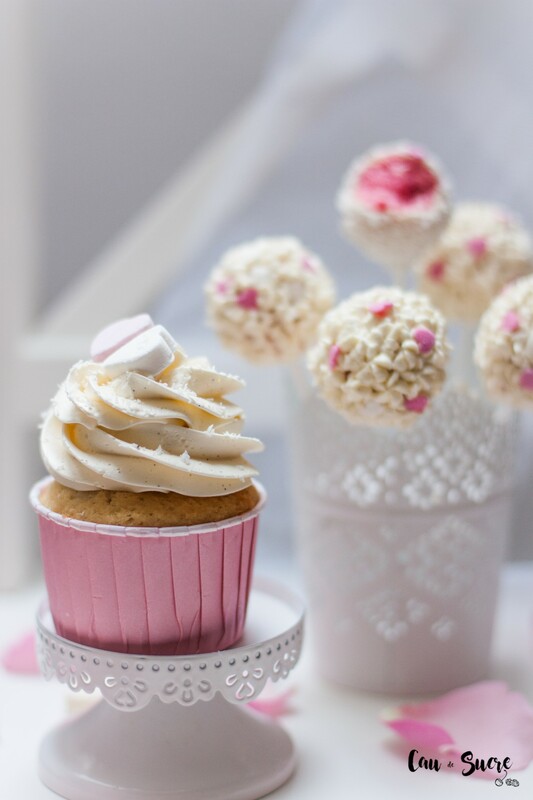 Fill a pastry bag with 2/3 of the buttercream and decorate the cupcakes to your taste with some sugar hearts if you have and sprinkle with a little grated coconut. With the rest of the cream we are going to mount the cake pops. 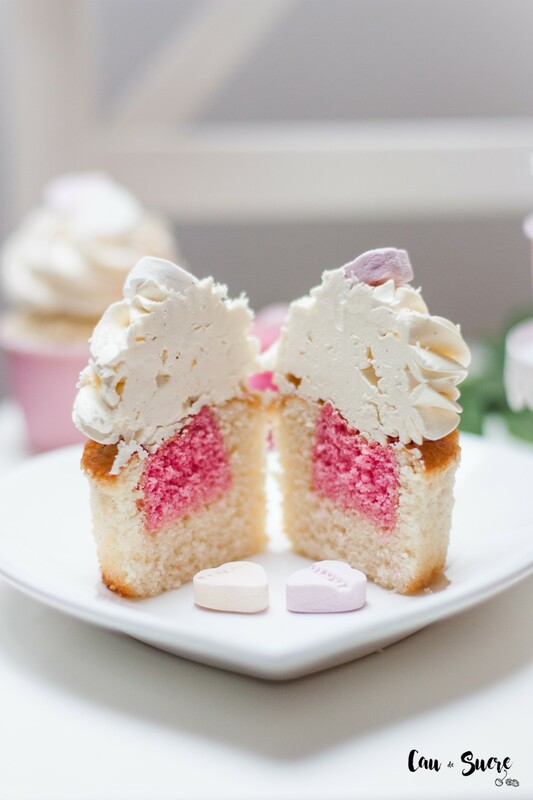 With the pink dough that you have left to cut the hearts, put it in a bowl and to add 3 heaped tablespoons of the buttercream. Mix well until you have a compact mass with which you can make balls the size of a walnut, you will get about 12 or so. Melt the white chocolate, we will need it to hook the stick to the sponge balls. Dip the tip of the sticks for cake pops in the chocolate and pinch it on the balls. Leave to dry for about 30 minutes with the sticks up, you can not turn them until they are dry. 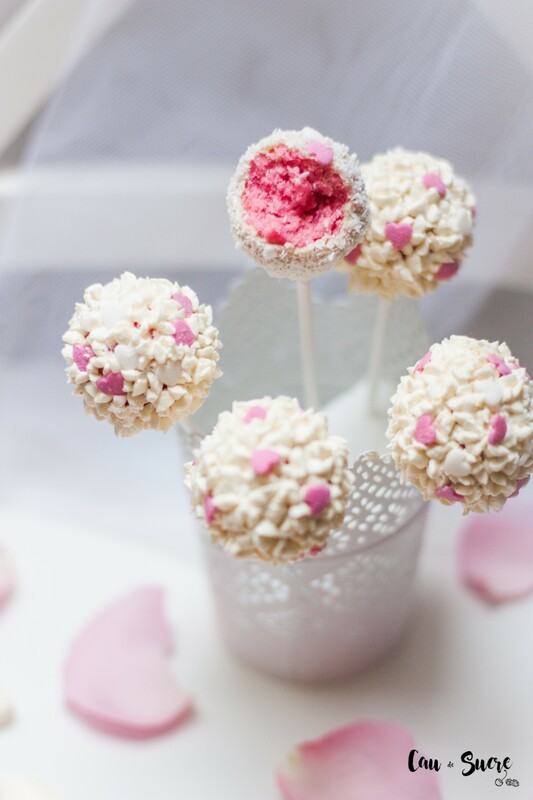 I have decorated the cake pops in two different ways, one very easy and one more entertaining. The easy way is to dip them in white chocolate, and before they dry the chocolate I have bathed them in shredded coconut. They look great and taste very good with white chocolate. For the others, I have used a small star-shaped nozzle, and with the remaining buttercream I have been making buttercream blossoms. Finally, you can put some sugar hearts to finish making them super cute.